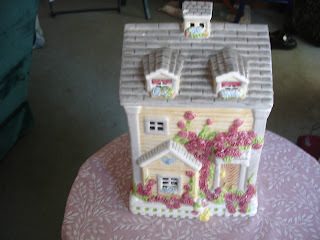 If you have just arrived at this page, please be sure to click on the title "Home Living" at the top, or here: http://www.homeliving.blogspot.com/ to see the recent articles. Then, bookmark Home Living on your favorites! 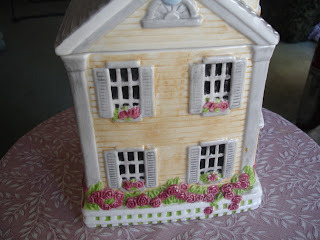 I enjoy looking at the Make Mine Pink Sites and blogs http://makeminepink.com/ because they are all about the home! Furnishing it, painting it, eating in it, supplies for the home and much more, abound in these sites. I admire the fact that many families have little businesses from home to add to their income. 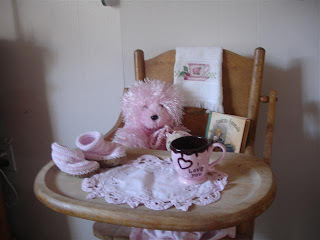 I like the way so many things are used in a new way and I like the tea party they are now having. We have been enjoying seeing the occasional Queen Anne or Victorian home in our area. One thing the Victorian families left to us was their houses. In them, it cannot be denied that they cared so much about their own families that they created places for them. Little turns and alcoves, both in the garden and the house, created places for children that would one day be the source of sentimental stories of growing up. Porches remain where family courtships took place. There were rooms where babies were born or where the head of the house kept his records and paid his bills. Some rooms were just for play, and others were artists studios. There seemed to be room for everything in an era where houses were built up rather than spread out. These two and three storey homes also meant there was more yard space and more space between one house and another. Victorian architecture was a combination of several different styles, all which were built within the 19th century. Victorians had one character quality that is largely missing today, although it was so strong in them, that some of it still permeates our lives in the 21st century. This was a strong sense of duty. In a sense, their style of architecture reflected their sense of duty, although that would require an entirely different type of article. In general, Victorian women felt a strong duty to be good wives and mothers. The culture of the family was reinforced constantly. Men loved to come home to a happy family, and appreciated the time a woman spent making that home beautiful, preparing "toothesome" meals, and dressing her children well. She had a little garden, as most people did in those days, which provided the best food for her family. She felt it her duty to be the guide of the home, a full time wife and mother who had power over society through her role as the homemaker. In Victorian times, duty was a strong word. It was a sense of personal responsibility and personal pride. It was considered shameful to have gone back on your word. Duty was such a part of the 19th century person, that society was generally ruled by it. Women who wanted to be good, felt it a duty to protect their children by personally nurturing them and seeing that they were taught manners, and that they offended no one. Men felt duty bound to build their family a house which would also provide part of the inheritance for future generations. Women felt it was their duty to be their husband's counsellor and closest ally. Children felt the duty deep within them to speak well of their parents and to honor them and to please them and avoid creating any kind of offense. Compare that to today, where shock value seems to be the order of the day, whether in the home or in the world. Duty was such a part of their lives that a person was careful not to promise what they could not fulfill, and careful to look around first and test the repercussions of what he did. Your word was to be trusted. People rarely went back on their word. Probably everyone has experienced the inconsiderate behavior of someone who held them up by being late or not showing up at all. In the 19th century, there were those, as there always are, who indulged in such inconsiderate behavior, but they were not considered reliable and would not be regarded highly. I have been home waiting for repair companies or guests that never came. This was considered in that day the height of rudeness, but today it is part of every day life, and we are not happier for it. We can learn a lot from the Victorian sense of duty. They carried this sense through their worst times. That strong sense of duty meant respect, reverence and regard. They would no more have thought of wearing shorts and flip-flops and a tank top to a church meeting than to someone's home. Even their walking gardens, parks and villages were so well laid out that it took a thoughtful walk through them to appreciate them. A sense of duty caused them to be careful what they left behind for others to enjoy, or for future generations. I wonder, what will our generation leave behind and what will the next generation think of our clothing, our manners and customs, our hospitality, our businesses, our art and architecture? Without a strong sense of duty, people will be careless. They will say, "Well, when I am gone, I won't care." We may be gone, and not care, but others will care. They will suffer the consequences of the way were. We enjoy everything Victorian--their beautiful designs, their love of gardens and flowers, their love of art, music and poetry and their social habits of calling on one another, having tea, and their handicrafts, still inspire us. Duty meant that they left things that would be loved and appreciated by others for generations to come. As discussed before, homemaking is much more interesting when it is done with an artistic eye. I believe the Victorian women felt a duty to beautify the home. I remember my own mother, grandmother, and great grandmother having time for many interests. Every year when the county fair came about, homemakers of all ages, even the little girls, entered their accomplishments. The sewing category was always full of the dresses that young women made, and it gave us so many stimulating ideas. There was a table setting display, flower arrangements, home decoration, cooking, gardening, etc. In some county fairs today, you can enter anything you want, and if there is no category for, they will provide one. Hobbies at home were the icing on the cake. We got our necessary work finished (ironing, laundry, dishes washed, cooking, etc) and made a little extra time to do the things we found most relaxing, such as sewing or doing up a room in a special way. Special interests often led to home businesses, another source of income. When women left the home and went into working away from home, many of these interests were neglected. I remember that my mother in law used to buy a special pan scrubber, which a woman made by crocheting nylon netting of different colors, into a circle. She bought these regular for herself and for gifts. There were other things that women sold from their homes, and it seemed like so many of these homemakers were proficient at least at one thing and would sell it to you. Victorian women felt it was their duty to teach the next generation of women how to have a well-kept home and raise a good brood of children. Men and women had a high regard for one another. Men wanted to protect women and women admired the men and wanted to marry once and have a family. The women had a strong sense of duty that propelled them to stick through marriage, through good times and through hard times. They recognized that marriage and family would have to go through trials, because they saw the previous generation do it. 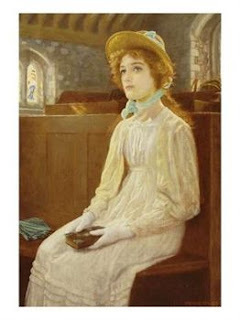 Today we are not as bound by that sense of duty, but we can certainly learn from the Victorian Women. 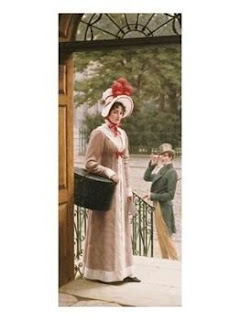 You can read more about the Victorian sense of duty in the book "Gaining Favor With God and Man," which is a great study in the character of Victorian educators, statesmen, and women. The book cites Mary Lyon, a prominent Victorian teacher of women, as saying to her pupils: (which dashes to pieces the modernists belief that women were not educated! They were educated, but more in the character quality of duty to marriage, home and family, than they are today) as saying, "Go where duty calls. Take hold, if necessary, where no one else will." Duty, as a watchword and inspiration, she kept before them constantly. Personal obligation, instead of personal fulfillment or fame, she sought them to remember. We should all live our best, like the example of these Victorian women, not letting time be wasted. We should seek what is good and lovely and pure and bring others to want to know more about the Christian way of life. Women who have a strong sense of duty will feel a driving force to keep their homes in a beautiful way, and to to embellish them with the things that bring peace and harmony to the home. I just noticed blogger has a place to insert a personal movie, and am excited about getting one ready. I thought it might be fun to do a basic decorating thing. I would like to point out that decorating was not always called decorating. It was home making. Today it has been made into a big deal, but it used to be a way to create a home that made it friendly and comfortable. I wrote an article about this earlier in this blog, on how you can "decorate" without appearing to decorate. It is the way you arrange things and clean them and the atmosphere you create. I am working on putting labels on all the articles so that there will be a decorating category, but this is taking some time. The story I wrote a few months back was about "decorating without decorating." It was how we used to arrange things before we even heard of the term "decorating." Someone had commented that her husband did not like decorating and wanted everything left alone, so I showed how cleaning could be decorating, and arranging could be decorating, and putting things away could be decorating. For example, you see a bare spot, and you put something there that you need to store, whether it be a basket or a trunk. You clean off your kitchen cabinet surface and you place a bowl of lemons there. Emily Barnes, in her book, "The Spirit of Loveliness" even goes so far as to suggest that after you thoroughly clean the fridge, you put a jar of parsley or celery in water and set it there to greet you when you open the door. Yes, even a cupboard or a fridge can be decorative if you clean and arrange things right. I showed how a lamp and a photo in a frame could be part of the decor. Everyone has these things and if they are chosen with care and arranged thoughtfully, they are part of decorating. You can clean the bathroom and carefully fold a towel and hang it up. That can be decorating for those who don't know how to decorate. That is how it begins. Someone sent me this link http://www.domestic-church.com/CONTENT.DCC/20030101/FRIDGE/baskets.htm to make easy baskets out of paper plates. You can get very pretty paper plates and make these. They are even less expensive than getting a container at the dollar store, and will encourage children to be resourceful. I think they are good for giving, filled with home made things. Someone sent me a sample of their own version of this using a much prettier paper plate. Home living has to be more than working. If everyone's job had an end-result of beauty, it would change the results considerably. I remember growing up how we used to have what is called "copy-books." Some of the students had made their's so beautiful, they were worth saving. They contained various subjects that we were graded on, and we learned quickly that we would either be miserable completing the task, or add beauty to it and relieve the pressure, increase the enjoyment, and end up with a project worth admiring. Today's cottages are by artist Susan Rios. You can order these prints at a reasonable price and decorate your home with them. 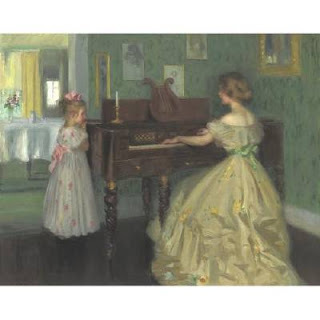 In previous articles on the Lady Lydia Speaks columns, I have mentioned how children will form some of their tastes, their likes and dislikes, visually. I had a painting of two children sitting on a little white fence with berry buckets in their hands. My children always wanted to have their picture taken in a similar pose. We tend to imitate what we see around us. Our moods can be greatly affected by the sights we see. In Elizabeth's Gaskell's "North and South," the main character, Margaret, wrote to her cousin and expressed her great sorrow over the gloominess of the place she had removed to. When we wake up to bleakness and emptiness, we can get quickly depressed. This sets a very cloudy forcast for the day! That is why, in going about the necessary work of the home, I believe it is good to include as much beauty as possible. Our grandmothers put out their little colored embroidery, their small vases of flowers, and all their pretty tapestry for a reason. The home is not intended to be a box where everyone lives a plain existence with no softness and loveliness surrounding them. Linda Lichter wrote in her book "The Benevolence of Manners" that modernist designers had taken away the beauty of architecture, so much so, that a songwriter expressed the blandness in a song with, "Little boxes on the hillside, little boxes all the same." These elitist designers believed in "less" and told people it was "more," hoping to talk them into such bland living. As she so eloquently stated, we have gotten more and more of less and less..."
When we live without beauty, as though we were in jail cells or army barracks, it can create depression. The little cottages here really are cheerful and give some idea that a simple structure that would otherwise be very depressing, can create a happy response in the human heart when it is decorated beautifully. It is in my opinion, important to approach other things, such as dish washing, laundry, cleaning up messes or sweeping, with an eye for detail and for beauty in the end. That means that when it is finished, it creates an opportunity to improve the look, not just with cleanliness, but with the things that make you smile; the things that make your heart happy. A favorite doll or toy in the book shelf gives the eye a rest and makes you smile as you glance across the book titles. A lamp sitting on a colorful cloth gives the surface some softness and creates less glare. -After cleaning the bathroom, fold towels in a special way and put out a fresh bar of soap on top of them. If you teach yourself and your children that there is a reason and a reward for the work of the home, they, and you, will approach it with an entirely different attitude. The Bible speaks specifically of a woman as the guide, or guard of the home. Many people misunderstand this to mean that the women have to do all the work at home, but this is not true. If it were so, she would be worn out before she even got started in the care of the home. In being the guide of the home, she is like the Chief Information Officer. She may not put everything away, but she knows where it should go, and will assign the task to someone in the family. She may not wash the dishes all the time, but she knows how it is to be done, and will guide others into helping her. She may not take out the trash, but she will inform others of the need of doing it. She may not answer the phone all the time, but her family knows she wants a record kept of them. She may not do all the cooking, but she has a general plan for the meals. She may know where every thing is, even if it has yet to be put away. As CIO she always knows where people's shoes, phones, wallets and keys are, even if she does not take care of them or put them away, herself. She is the keeper and guide of the home, not the industrial worker, keeping a time card. She is there to find ways to make the home run smoothly and function at its best for the development of the family, not just as a janitor. Members of the family should never get the idea that just because the woman is at home she should do all the work. That is not what she is there for. The work has to be done, it is true, and there are some things that only she can do. For example, I have a few rooms that I cannot employ anyone else to do because the items require my personal evaluation before putting them away or discarding them. The homemaker's job is to guide the home and see that the things are accomplished so that the members of the family can function. It is not her job to pick up after everyone or wait hand and foot on everyone. Generally her energies should be reserved for those who are more helpless, such as babies and toddlers and those who are not well or physically able. The family is not there to be catered to constantly by the homemaker, but rather to aid her in fulfilling her noble purpose of guiding the home. In helping her fulfill her role in guiding the home, it is important that the other members of the family, including husbands and sons, not create more burdens upon her. At work, they would would not be allowed to leave piles of personal posessions around in other people's work space, and so at home, their consciences should be stricken if they create more work for the keeper of the home. If they are not bed-ridden or severely handicapped, they can do something to aid her in her goal of guiding the home. They should be aware of her likes and dislikes. They should care about how she feels about the home. Remember, that being a keeper of the home does not mean that she spoil everyone to the point that they become helpless, and create more distress for her and more messes around the house. Some homemakers can be stretched to the point that instead of enjoying their beautiful homes, they would rather be somewhere else, just because the members of the family are so inconsiderate that they expect her to do things that they physcially can do for themselves. They should not create unnecessary work for her. Sometimes husbands and grown children get the idea that because they are out working somewhere else, bringing in a paycheck, that it constitutes a right to slack off and be pigs at home. In claiming to be completely relaxed, they drip food all over the house, leave their plates and cups wherever they last sat, and strew the newspaper all over the floor. They leave these messes just waiting for the homemaker to "do her job" and pick them all up. This is a completely ignorant misunderstanding of the work "guide" and "Keeper" of the home. If a man wants to be the king-of-his-castle, he needs to help the keeper of the castle in her job, and not turn it into a slum. If a man wants to be proud of the home and the family and look at it as his own accomplishement as well as his wife's, he needs to be considerate. This does not mean he has to take his turn doing dishes. It does not mean he will be in charge of the laundry, the vacumming, the bed-making, or cleaning the toilet. It does not mean that the husband has to make his side of the bed when he gets up, or that he has to clean out his closet. What is means is that, in view of the fact that the women in the family will be doing the laundry, he doesn't make it more difficult for them by leaving his own laundry all over the place for them to hunt down and pick up. Bad habits such as leaving things out, will not be tolerated in the work place, so why should irresponsiblity reign so much at home? Asking everyone to be courteous of the homemaker does not mean the household will be ruled mechanically with an iron fist. It just means that the other members of the family love her enough to help her. The working son or daughter who has spent the day away from home, knowing the burdens of washing the dishes, will be considerate and not use all the glasses in the shelf, and then, when it appears there are no more, go to the china cabinet and get out the better ones and use them all up. They will find innovative ways of diminishing the work load. The best way to be conscious of this, is to pretend they are a guest in someone else's house, or that they are in someone else's place of work. For example, instead of getting out a drink and leaving the container on the surface in the kitchen, they will dispose of it themselves. Maybe they will scrape their own plate instead of leaving it all for the one who is cleaning up the dishes. Maybe they will put away the peanut butter jar instead of leaving it out after they have made a sandwich. They will rinse the sink after using it in the bathroom, so as not to disgust others who happen by afterwards, and not to spread bacteria. They will toss out their paper cup after brushing their teeth, rather than leaving it out. They will be conscious of the burden they are creating for the keeper of the home. I married a man who for some reason liked to have a pen in every room, and a pen on every shelf, every surface, every table, every where. I could not figure this out for awhile, because I owned one pen, and I always knew where it was. I was from a large, poor family, and we did not have a lot of things. I had a pen that had a little lever on it that allowed it to drink up ink from a bottle. It was kept in a top drawer of a desk and it was never lent out. In those days (time changes so rapidly, "those days" were not so long ago), pens were personal because the way an owner wrote with them could wear down the nib in a distinctive way. Others would not be able to write as well with them. My husband was from a family of only two children, and I was from a family of 9 people. Therefore when they got a package of pens, it mean they could all have several of them. He put them all over the house so he would not have to look for one when he needed it, and that is why I kept finding pens all over the house. Add to this the papers that usually went with them, the wooden toothpicks, the tie tacks, his favorite mints in cellophane, the mail, and a dozen other little "things," and my housekeeping was driving me crazy. Another thing I did was to show him the list of things I had to do: the ironing, the washing, shampooing the carpet, sorting the laundry, making beds, etc. I also showed him some of my favorite books of houses and house plans and interiors, and told him what I was trying to achieve, and how my mind rested so much better without too much clutter. In these pictures you rarely see a stinky old pair of tennis shoes and dirty socks in the middle of a room for someone to trip over. While out on a shopping trip, we ducked into a nice shop that sold things for the home. He enjoyed going in there so much that it became customary for us to shop there. I pointed out that one of the reasons it was so pleasant to go there is because there was no unnecessary clutter that would spoil the atmosphere or the view. Our grown sons and daughters could use these lessons to help them understand how order in the home contributes to a feeling of well-being and calmness. Students particularly are fond of coming into the home, slamming the door, dropping bags, going to the kitchen, eating, leaving a mess, dropping their clothes in a corner in their room, or even on the bed, and for weeks and weeks they live like this, while their mothers become more stretched out with their time and their nerves. The homemaker is the keeper and the guide of the home, and that does not mean she is just there to work. We all have yard clutter, too, and paintings like this are good teachers for the family, as they can appreciate the serenity of the house. Yard tools and such can be housed properly, and people do not need to create more stress for the homemaker by expecting her to put them away. In the end, the place we love the most will be the home, but the homemaker is not the only one responsible for its atmosphere. Other members have to be responsible to make it run smoothly. Remember, she probably does not get a paycheck and is trying to make a profit by doing most things herself. She doing this out of the goodness of her heart and the conviction that she is in charge of it. To summarize and as a reminder of the main point: The woman is the guide of the home. She may not do all the work but she is responsible to see that someone does it and that somehow it gets done. The members of the family are responsible to help her achieve her goals of completion of tasks, cleanliness, orderliness, and beautifying. In doing so, they stand to benefit enormously. If they create more problems and stress for her, they will suffer from personal confusion and stress themselves. Additonal comments: It is also a good idea to prepare the family to get along on their own, so that the woman, in a sense, works herself out of a job, or at least part of it. That way, when she is older, she is not still doing the same things, especially those things that require more hard labor. She ought to, as she gets older, have trained the family well enough that she can put up her feet and read something, or do some needlework, while other members prepare dinner or do the washing up afterwards. Unfortunately, the trend of our time is all too much the opposite. Instead of becoming more independent and taking care of themselves (not to be confused with the Biblical concept of inter-dependent), the husband and children retreat more into baby hood. This is partly the woman's fault if she spoils them. There is nothing wrong with waiting on your husband or children if you want to, and if it gives you joy, but they should not demand it and they should know you are a human being with only two legs and two hands and do what they can to eliminate the burden of jobs in the home, especially if they are creating a lot of the mess. When I was a teenager we were invited after church to visit a preacher's family. They had four daughters, all teenaged. When we got there we were rather taken aback at their attitude. Their mother asked them to help, and to wash some dishes that had been left, but they would not do it. She ended up serving us all by herself. Their kitchen was always piled high with dirty dishes and yet they had four able bodied girls. I would have understood it more if the family had busy boys who were working or were not too adept at dish washing, or house keeping, but with four able-bodied girls, I felt ashamed for the mother and for them. They were not cooperating with their mother in preparing the meal and not helping at all with the washing up. I never understood it and was at the time quite apalled. I was only 16 at the time and would never have talked back to my mother the way they did theirs. Little did I know that this was going to become a trend amongs modern families. It was like sliding downhill with no way to go back. Over time, more and more families operated this way. The mother of this girl eventually got sick and died. I think the family should be prepared to take over the house if the mother does get sick. I'm sure most women get headaches and have down days, and it seems to me they could recover more easily if the house was kept up and if they didn't have to wake up from illness to face a mountain of laundry, dishes, clutter, and unnecessary work--work that was caused because people didn't put away anything or becaue of the trash people left around. I cannot help wondering if some of this downhill slide in homemaking has something to do with the great amount of institutional living that goes on. Whereas school children once had to help sweep the floors and clean the chalk board, now they merely study while janitors take care of it. When home, they may think that it is the woman's "job" to do all this--including sweeping out the garage and growing a garden for food...and then heap more burdens on her by their careless habits. Jesus chastised the Jewish leaders for the burdens they put on people, saying that they would not lift a finger to ease their burdens, but put more burdens on them. The woman at home is such a precious and unique thing in our society it would seem that men and children and the relatives would do what they could to make her temperament good by cleaning up after themselves and doing what extra they can, also. She can be a better companion to them, and she can be an encourager, if she isn't worn out. I remember my mother was always a listener and an encourager, but she made us kids do all the work! Our daughter and her husband and family have been settling in to their apartment. Here are some pictures! Fresh flowers from the garden, in a decorated glass jar--a piece of wallpaper with glitter, glued onto an old vase. The entrance: just a coat rack in a corner. The library and sitting room. The book cases are fold-away kinds that you can just open up when you take them out of the box they come in. Also, because of the way they are built, with slats rather than whole boards, there is air circulating around the books. We really like these book shelves! The closet. We still have some work to do on this piece of furniture. We plan to make it look like an armoir, with a mirror on it. Wall sconce. The scent of the candle is called "Petal"
Even after all that, the one subject that I get the most emails about is depression. I can not help thinking there might be a connection in the lack of these interests in life, (and the lack of many other things) and depression. Because of several recent emails on the subject, I will address just a portion of this subject. One that I should have included in the Lady Lydia Speaks section, should have been "Good Health," because lack of good health can depress the emotions considerably. In spite of this, there were many people in the past, and many people today who can raise their minds above their infirmities and pursue life in a happy way. I am thinking of people like Robert Louis Stevenson, who write his books and poetry as a bed-ridden invalid, and Elizabeth Barrett Browning, whose ill health did not deter her from writing poetry. 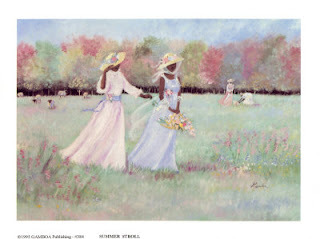 People today like Joni, paint pictures and do many other things in spite of severe handicaps. Therefore, perfect health does not insure perfect moods and poor health does not necessarily mean depression. However, health is a consideration in alleviating depression, and for that reason, I want to address the avenue of sleep, as one way to create more optimism and ambition. Granted, there are certainly many other things such as our words and thoughts, our view, our habits, food, weather, debt, relationships, disappointments, living conditions, which add to anxiety, but for time's sake, right now I'll only address this one. Sleep: We have fallen far away from the original purpose of sleep and have abused our health and ultimately our minds by our careless sleeping habits. Improper sleep can contribute to lack of motivation and to emotional problems such as short tempers and bad judgements, which then go on to ruin good relationships within the family. This can put a person at risk in other areas of health. The stress of temper problems coming from lack of sleep, resulting in relationship problems, can then cause digestive problems. *Clean up your bedroom and make it spacious, and open windows to get fresh air. *Use the most natural fibres you can find for your sheets and blankets and pillows. Man-made fibres are things like nylon and acrylic. Natural fibres consist of: cotton, wool, flax (linen), silk, bamboo, or hemp. Find pillows and mattresses that are stuffed with something other than acrylic fibre-fill. The chemicals from the artificial materials could add to health problems. *Use a natural hand-made soap instead of a commercial soap, when bathing before you go to bed. Instead of taking a shower, take a bath. Baths are more relaxing. Commercial soaps sometimes have more chemicals in them than soap. You might think that a bar of natural hand made soap is expensive, but it lasts sometimes months longer than a bar of commercial soap. When you buy good soap, you are supporting the people who have home businesses and are making a living for their families. *After 6 p.m., slow down rather than speed up. Wind down, not up. Lower the lights in the house with indirect, not over-head lights. In my home, I allowed the overhead light bulbs to go out and never replaced them. It keeps us from flipping on a switch and bringing on sudden harsh light into someone's eyes. Now, we turn on the little lamps that give an indirect light that is not as irritating. *Pray for everyone you can possibly think of, before you go to sleep. *Wear natural clothing to bed, and even in summer, gowns with sleeves on them are better than sleeveless bed clothes. *Do not start a controversial conversation or talk about bad news before you go to bed. Avoid the television--it is full of bad news, which eventually interferes with sleep and adds to feelings of depression. *Do not use alarms or alarm clocks. Go to be when it gets dark and get up when it gets light. When you get used to this you will find you automatically go to sleep and wake up after you have enough sleep. 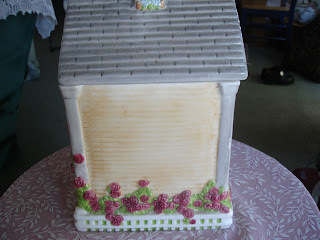 I was amused after the scone recipe that so many people wanted the cookie jar! Here is another side of it if anyone wants to look for it. The underside of the jar says "Int'l Ceramics." There must have been quite a few of them made, because I got it at Wal-Mart a few years ago for about $5.00. 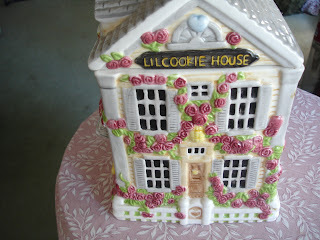 If you type in "House Cookie Jar," "Victorian House Cookie Jars" or "Cottage Cookie Jars" you will get better results. So meone gave me this 100-plus old wicker couch. They said they were "sure glad to get that thing out of our house" because it took up so much room. 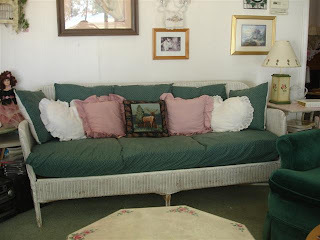 I have owned it for about 15 years now and have changed the fabrics and cushions several times. The lamp on the right came from a yard sale, as did the table it rests upon. The pictures on the wall are greeting cards put into old frames or dollar-store frames. Here is my favorite rug, made of strips of old sheets, old dresses and fabric that I didn't need, crocheted with a giant crochet hook, by my daughter. She sat down one day and did it in a few hours. You can use baby things in your house even if you do not have children. I kept this old high chair that someone gave me, and used it in the dining room. It is a good place to park things I have kept for years. It is too bad there is not a "before" picture of this shelf. It was a beaten up old thing someone had thrown in the trash. The pieces had come apart and it was unpainted and simply awful looking. When I brought it home, my family groaned! However a bit of wood glue and some cabinet paint fixed it up just fine. The floral design is painted with flower shaped sponges. I use cabinet paint or bathroom paint for my projects because it does not chip as easily. 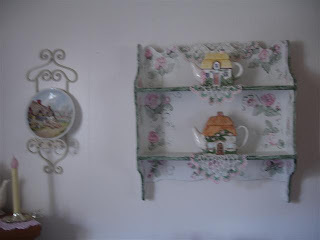 In this shelf are cottage tea pots and old doilies left by a great-grandmother. I learned to decorate up high when my children were little. That way I could function with children in the house and not always worry about things setting out. I am not saying that it is practical for everyone to live like this, but that it is important to know how to furnish without spending, when necessary. These things, if taken care of can be sold for 100% profit. Taking care of them increased their value. One thing many new homemakers have to learn is that it that one of their duties is to find ways not to spend money. It seems in better times, many of us have felt it our duty to spend. However, when the family budget is tight, the homemaker can not only make do with free things or cheaper things, she can actually make them better and make money from them if she has to. 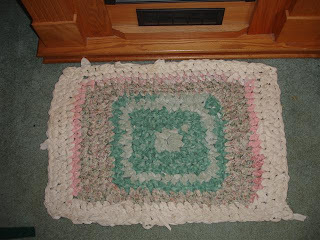 This is a favorite mat my daughter made one day. She sat down with one of those giant crochet hooks and crocheted torn strips of sheets, old dresses, and fabric. 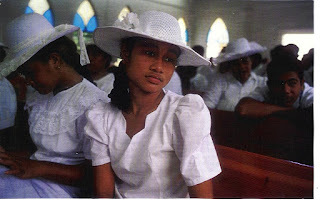 It was interesting to see in the recent issue of Traveller, this pretty picture of Samoan girls in church, and to read the caption, which said, "Sunday Services in American Samoa evoke a portrait by Paul Gauguin." This photograph shows modest, beautiful, constructed clothing (and also dispels the myth that people living in equatorial regions do not care about modesty), than we have not seen on store clothing racks for some time. A lot of the new styles are so deconstructed that there are no buttons and no pieces sewn together anymore; just one slinky thing you "throw on." The designers and manufacturers, advertisers, convince us that clothing has to be so simple that it cannot have any structure at all. These girls in the photograph look sweet, innocent and feminine. Deconstructed clothing would change that look to hard and jaded. Yes, this picture would certainly inspire any traditional artist, and even Paul Gauguin, an impressionist, painted ladies wearing better clothing than they parade around in today. I know these girls look better than most of the women we see, and yet I also know that American Samoans are not rich people! Clothing is a matter of wisdom, taste and discernment, not a matter of wealth. I have been to a few countries like this and have been impressed at the color and the fabrics that the women wear. They love being women and like dressing in beautiful dresses. They live in poor countries, and dressing up is important to them. I remember as a child how important it was to dress well, because it disguised your poverty, even to yourself. Now, our designers have foisted upon the public the worst clothing in history. The 20th century deconstructivists focused mainly on desconstructing art and architecture, and the attitude of such people has trickled down to the fashion industry. Clothing used to have color and at least a collar that would soften the face. Ladies liked to have little lace at the throat. It has been years since I've seen collars or sleeves. The bottom is the biggest part of the body, and skirts used to completely disguise that fact. Thanks to the deconstruction of clothing, no one can deny that fact. Now, when we see a woman's outfit, the eye is drawn downward from the baggy shirt to the clam diggers and the strings of thongs at the waist to the clacking flip-flops at the feet. The poets of old who described women in their verse, would gasp in despair. No artist of the 18th or 19th century would stop in his tracks and beg the subject to stay right where she is while he captures the moment for all time on his canvas, so that he won't forget the blue/orange streaked hair and the 5 rings in various parts of the face and body. When I was a youngster, we thought body piercing was a sign of ignorance. Educated, civilized, enlightened people were far above such savage practices. How far we have come! I have mentioned in previous articles that we are boring our own children by the drab clothing we wear. Think of what they see at their short height, and you will get the picture: bare legs or tight, low-cut jeans are their view. Wearing pretty fabrics with interesting prints could delight little children and stir their appreciation for art and beauty. I just returned from the Scandinavian Festival, which celebrates the Scandinavian culture prior to the 20th century. The photograph on the left shows the performers of the various Scandinavian dances on stage, in their costumes. These costumes reminded me of the paintings of Daniel Ridgeway Knight, who lived in Pennsylvania during the Victorian era. Would we be such an eager audience if these dancers were dressed in contemporary deconstructed clothing of stretchy tee shirts, low slung pants, short-shorts, strappy tops and other shapeless clothing? All around the festival grounds, deconstructed clothing, drippy, droopy, muddy, colorless, flat clothing that did nothing to flatter a woman's hair, face, figure, or draw attention to her personality, posed as "fashion." Who has done this to us? It has to be someone who hates women, because there was not one woman who looked good in these deconstructed outfits, and not one outfit actually fit anyone's figure. The performers and the other people walking around in costume looked wonderful, and not the least bit embarrassed or uncomfortable. The older ones dressed just like the younger ones, even the children, and there were no special outfits of the period made to "express' their teen-hood or independent spirit. Little girls wore little costumes and big girls wore bigger ones, but they all looked very bright and cheerful and put-together. For those who think it would be impossible "do" anything in a dress, it was obvious that these people were able to perform very intricate and vigorous dances in them, and they seemed quite happy about it. The people who served food at the various booths were also in these 19th century traditional costumes, and were able to make lemonade, meat pies, ice cream, and any type of food available, without the costumes getting in the way. The craft booths were also attended by people in costumes and they seemed very able to conduct trade in these clothes. These clothes were so beautiful to look at that people were asking the performers, "Where did you get your dress?" The costumes reminded me of one of my favorite artists of the 1800's, Daniel Ridgeway Knight. I just had to come straight home and take another look at these paintings. He was an artist from Pennsylvania, who loved to paint in the open air so much that he built a glass room so that he could paint when it was cold or wet outside, and still get the feeling of being outdoors. 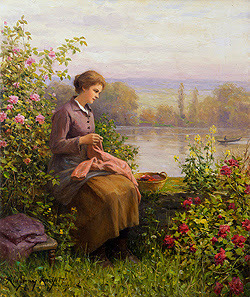 You can read more about him and see these amazing paintings with their bright, clear colors and pastel backgrounds here http://www.rehsgalleries.com/virtexdrk.htm These paintings of the past give a clue about the construction of clothing. The garments portrayed in them seem to look good on many women. In the photograph of the festival I attended, the costumes looked good on both the thin women and the heavier ones because of their feminine appearance, the clear colors and the good construction. It can not be so much trouble for designers and manufacturers today to give us beautiful clothing like this. 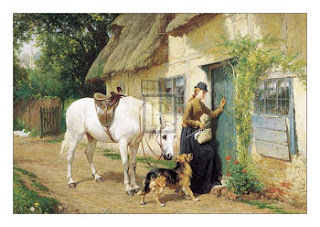 To view the vivid works of the Victorian painter, Daniel Ridgeway Knight, go herehttp://www.rehsgalleries.com/virtexdrk.htm In my opinion this is the best showing of his works anywhere online. One that I particularly like shows two women waving to a ferry across the river. 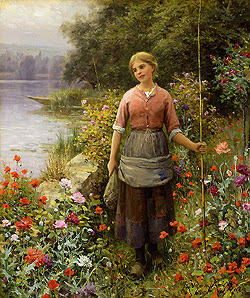 Daniel Ridgeway Knight liked to paint women in contented poses doing ordinary things, in beautiful clothing, surrounded by beautiful scenery. 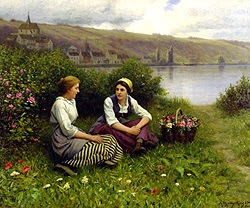 The scenery and the women always seemed to belong together. What can we do about these fashions that are making our people look so depressed and unhappy? Clothing can be beautiful and still cover the body adequately. We do not have to wear these awful clothes. We can make our own. We can pay someone else to make them. There are even ways to create modest skirts and dresses without sewing, by the way they are folded or wrapped. Now, with velcro and fabritack, not everyone has to know how to sew. You do not have to be at the mercy of the manufactured styles. You can also buy beautiful clothes on the web. I think today that maybe women are afraid of the "b" word: beauty. They feel self conscious in beautiful clothes, so they want to go around in drab clothing and not be noticed. Homemakers may think they do not need to dress nicely at home, but clothing can help create the mood for their work and make it seem important or not. Their performance in the work of the home can be affected by clothing. Many of the artists of old painted women at a time when women's work was primarily that of the home, and yet they are in beautiful clothes. Another think we can do to encourage women to get back to feminine, dignified dressing, is to smile and compliment anyone we see who is wearing a pretty, modest dress. *And now to the resident whiner/complainer and deconstructionist: I dont' care what definition some arrogant deconstructionist hippie professor in the 1960's gave this word. I was born long before the 1960's and I can give it whatever definition I want, but I prefer to use the original Latin and French meanings of the root words. "de" means "to move away from." Construction entails building something or creating something using pieces and parts. In their favor, the deconstructionists definition of deconstruction is actually true: it is a movement away from reality and a rebellion against truth. Apparently people after the 1950's can create their own philosophy and definition, so I can create my own definition if I like. It is still the same meaning: elitist looking down your nose at goodness and loveliness and giving women so few affordable choices that they have to wear garbage sacks, and laughing all the way to the bank. That is deconstruction. It doesn't just dismantle clothing construction as it was once known, it dismantles the humanity of the person who has to wear it. No one would do it to an animal.